Last Saturday, Cousin Jacky put on a Passover celebration for the family. I travelled to Jacky's home with my Cousin Paul. I was lucky to get that ride with Paul, because I don't like driving much anymore. There were eleven family members there. We did all the traditional things for a Passover Seder including telling the story of Passover describing the great of escape of the captive Jews from Egypt. 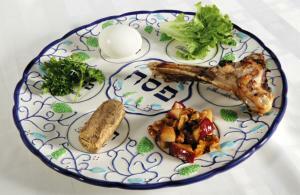 Here is a picture of the Seder Plate, each food of which reminds us of the Passover story. George - I'm curious, as I don't know much about the Jewish Passover, what is each item and what does that item represent to the Passover story? Here is a [link] which tells about the foods on the seder plate. Here is a [link] which tells the story of Passover. George, do you eat the food on the Seder Plate? Very delicious food! The venue is equally nice. Last week my friends and I went to one of iconic party venues in Chicago. Food there was outstanding and prices were quite low. It was a perfect girl’s getaway weekend! Now, you can get the authentic and most reliable luton valet parking service for the safe and secure journey.